Metafisica Australe 2017 is a rich, contemporary symbiosis of the personal, professional and cultural reflections of two great Australian artists. The subject of this year’s QAGOMA Foundation Appeal, Metafisica Australe is a significant 72-panel painting that is the latest artwork resulting from the collaborative efforts of Michael Nelson Jagamara and Imants Tillers. Simon Wright was present when this important working relationship began nearly two decades ago. 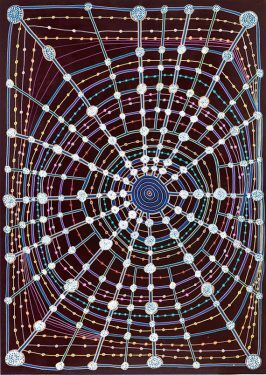 In 2016, when Five Stories 1984 set the highest price ever paid for a painting by a living Aboriginal artist, Michael Nelson Jagamara — a Warlpiri man from remote country near Papunya — became lauded as the new holder of an auction world record. While the record is one measure of success, it does not adequately account for his 40 years of dedication to painting, or to his record of innovation within tradition to evolve new visual forms. Since his emergence in the second wave of Papunya painters, Michael Nelson’s groundbreaking practice has been punctuated by early cross‑cultural collaborations (with Tim Johnson) in the mid 1980s; and by his later adoption of new styles — explosive, gestural expressionism, and bold moves away from the traditional ‘Papunya palette’. Michael Nelson has always held true to jukurrpa,1 while managing his obligations as an elder in his community. He had no idea who Imants Tillers was in 1985, when their paths crossed because of the now infamous Five Stories. 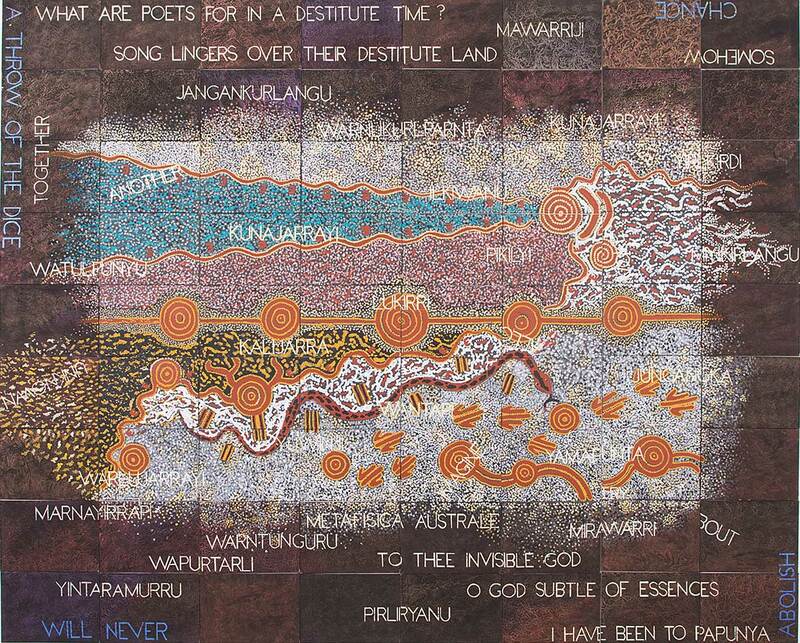 Imants Tillers, who was born in Sydney to Latvian parents, is also internationally renowned as an Australian artist. He emerged during the heyday of conceptual art in the 1970s, the same decade in which the Papunya painting movement was gaining attention; and in the 1980s, when he represented Australia at the Venice Biennale, just as his practice became synonymous with appropriation. From one perspective, often associated with global currents in postmodernism, appropriation relates to borrowing and sampling from other works. In other cultural knowledge systems, appropriation equates to the theft of ancestral intellectual property. When, without permission, Tillers ‘quoted’ from Five Stories, in his 1985 painting titled The Nine Shots, it raised not only the distant ire of Michael Nelson, but also the whole temperature of a debate in Australian art that is still relevant today. Responses to Tillers by artists (such as Gordon Bennett), art critics and scholars, and the raft of issues that accompanied the work, further added to the currency accrued by Five Stories when it set the auction record 21 years later. By then, it had become one of the most frequently reproduced and highly profiled images in Australian art. In person and in public, these two artists appear modest and reserved, storytellers through their art alone. Each is motivated to paint ideas of ‘self’ and ‘place’, in terms of ancestral lineage and origin, as well as being concerned with the selection and placement of signs and signifiers, often borrowed or reproduced, in order to allude to wider narratives. They are also astutely aware of cultural traditions and authorial power. Although they are now highly renowned artists in their own right, the story of ‘their place’ in Australian art is only just beginning to flourish. It is a story borne of a unique set of circumstances that once had them at odds — art worlds apart — but which has since made them counterparts and collaborators. In keeping with the improbability of their cross‑cultural exchange was the unlikelihood of it happening in Brisbane, which, so it turned out, played a defining role in this meeting of minds. Despite knowing of each other since 1985, it took until 2001 for the artists to meet, when Michael Eather of Brisbane’s Fireworks Gallery began to facilitate an ongoing dialogue between them. Over the ensuing 17 years, their conversations have raked over old ground, generated mutual understanding, and formed new common ground. Their collaboration, and growing friendship, has allowed a faith to emerge between them that has changed their practices and wider perspectives. In moving together, these two elders of the Australian art world personify a fraught but meaningful relationship, characterised initially by trespass, then by an understanding of past misgivings, and finally, by a commitment to future meetings of the mindful. In Metafisica Australe 2017, the two artists riff off the record-breaking Five Stories painting, bringing myriad layers into focus, including their own tale of entangled trajectories, and with that, another great story of Australian art. 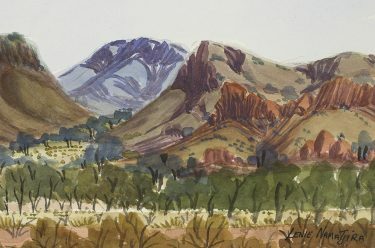 In this work, they consider some of Australian art’s many ‘intractables’: the ethical dimensions of non-Indigenous artists referencing Indigenous art; the evolution of protocols and permissions in an age where sampling and repurposing is ‘normalised’; and even the potential for art to ‘sing’ in a postcolonial moment. It is, perhaps, a leading example of practical, as well as symbolic, reconciliation. 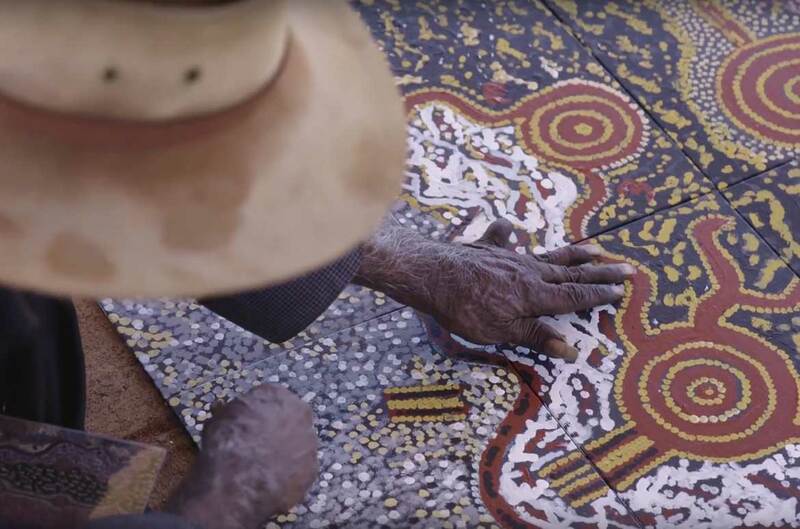 1 The term jukurrpa has an expansive meaning for Warlpiri people, encompassing their own law and related cultural knowledge systems, along with what non-Indigenous people refer to as ‘dreaming’. With your support, the 2018 QAGOMA Foundation Appeal will bring this significant collaborative work into the Collection, where it will find a perfect home within the Queensland Art Gallery’s reimagined Australian collection display. Simon Wright is Assistant Director, Learning and Public Engagement, QAGOMA. 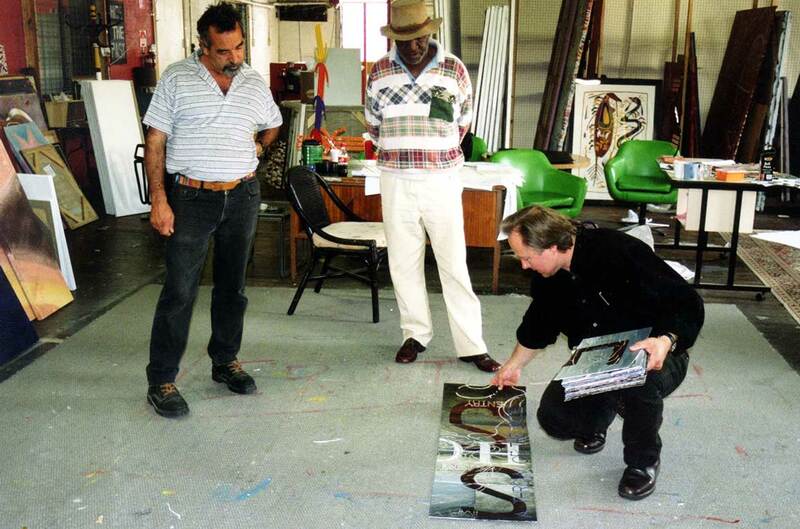 In a previous role, he documented the first meeting of Michael Nelson Jagamara and Imants Tillers in 2001, and has since developed exhibitions and collections featuring both artists. Next PostNext » How can art and science be used to imagine a shared future?